Pattern Description: This pattern is covered in wavy connected lines (raised, smooth and flat) that have a consistently sized stippling between them. The well defined lines make it easy to identify. 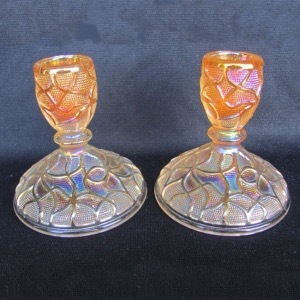 This pattern is a great example of how texture and depth are impacted by carnival glass iridescence. The raised flat meandering lines and the lower stippled areas catch the light in different ways, contrasting beautifully. 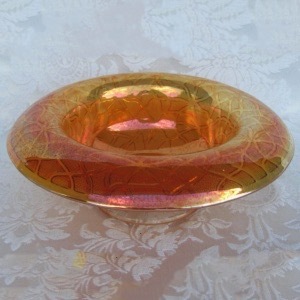 Only known in a few shapes (water sets, console sets) and probably at the end of the carnival glass classic era (1929) it is also only reported in a few basic colors. 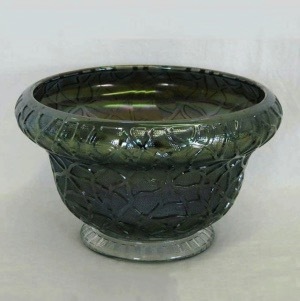 The water pitcher and tumblers are standard sized, the candleholders (for the console set) are only 3 1/2″ tall (with a slightly domed base), the console bowls vary greatly in top edge treatment (low flared, deep cupped, deep rolled rim), causing the diameter to run between 8 and 10″ across. 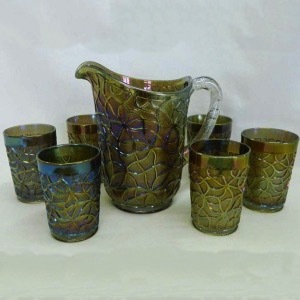 The pattern has some similarities to Crackle and Hobnail Soda Gold, but is very distinctive with the raised flat lines running through it. 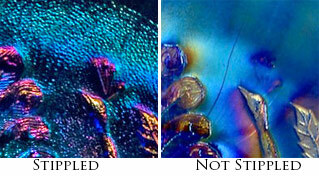 See crackled-comparison here.